In today’s episode we will be discussing how mobile phones are changing our lives – for the better. आजच्या भागात मोबाईलमुळे आपल्या आयुष्यात कुठले चांगले बदल होत आहेत त्याबद्दल बोलणार आहोत. Hi, I’m Tom. Welcome to the programme, everyone! सध्या मोबाईल आपल्या जीवनाचा अविभाज्य भाग बनला आहे. आज आपण, मोबाईल आपली जीवनपद्दती कसं बदलतंय या बद्दल बोलणार आहोत, Of course चांगल्यासाठीच! आता मोबाईल एवढा महत्त्वाचा झाला आहे तर असा प्रश्न पडतो की २०२० पर्यंत जगात किती मोबाईल ‘subscriber’ असतील? Well, here in London, everyone is on their phone all the time! I say 100%! Yes, but our quiz is about the whole world’s population, Phil, not just that in London. Think about it, and we’ll give you the answer later in the programme. आता आपण बीबीसी आफ्रिका बिझनेस रिपोर्ट ऐकू. टांझानियामध्ये मोबईल अप्लिकेशनचा वापर करून लोक आरोग्य विमा म्हणजे ‘health insurance’ काढत आहेत. आधी शक्य नव्हतं. यामुळे ‘healthcare’ म्हणजे आरोग्याची काळजी घेणं सोपं झालंय. आधी हे शक्य नव्हते. For millions of Tanzanians who live on low incomes, health insurance is a luxury they simply cannot afford. But, technology is beginning to change the landscape. Two years ago, mobile phone subscribers here in Tanzania rose by 25%. Now, technology analysts are convinced that mobile phones could indeed be key in changing people’s lives in many aspects. With only a basic feature phone, a customer can register for a policy and make payments for premium as low as a dollar a month. You see, Tom? It’s not just London. 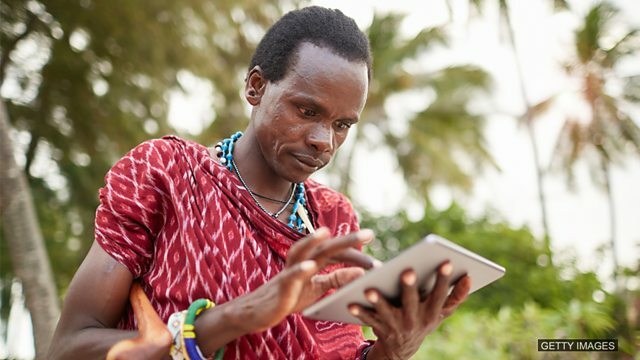 Mobile phone subscribers in Tanzania rose by 25% two years ago! Yep, you’re right, that is a huge increase. But what was more interesting to me in the story is the positive impact that mobile phones are having. ‘To have a positive impact’ म्हणजे सकारात्मक परिणाम. याच्याच विरुद्ध ‘to have a negative impact’ म्हणजे नकारात्मक परिणाम किंवा दुष्परिणाम. And, it’s nice to hear that mobile phones are actually having a positive impact on people’s health. Often, we just hear the opposite. We often hear the opposite because it’s true! Mobile phones are having a negative impact on our health, our relationship with others… They’re often bringing about social change in negative ways. ‘To bring about social change’ म्हणजे समाजातील बदल समोर आणणे... I agree that mobile phones can be distracting at times. But don’t you think giving people access to healthcare is an example of how mobiles phones are bringing about social change in a positive way? Before you answer Phil, let’s go back to our quiz question from earlier, २०२० पर्यंत जगात किती मोबाईल ‘subscriber’ असतील? Statista.comच्या अंदाजाप्रमाणे याचं उत्तर आहे, जवळपास ७०%. So, mobiles phones are here to stay. मोबाईल राहणारच. Clearly! And, yes, of course I agree that access to healthcare should be a basic right. ‘A basic right’ म्हणजे मूलभूत हक्क. But, even though I agree that being able to see the doctor when you’re ill should be a basic right, it’s also a luxury that many people can’t afford. Very true. ‘A luxury that people can’t afford’ is म्हणजे न परवडणारी चैन. Absolutely! Which is why I like this story so much. Now, it seems seeing a doctor doesn’t have to be a luxury that people can’t afford. Becauseit’s literally at their fingertips, you mean? Exactly! Phil, did we just agree on something? I think we did, yes. तुमचं काय म्हणणं आहे यावर? तुम्हाला नाही का वाटत, आरोग्य हा एक मूलभूत हक्क, ‘a basic right’ आहे? असं आणखी कुठल्या प्रकारे मोबाईलमुळे आपल्या आयुष्यावर ‘had a positive impact’ झाला आहे असं वाटतं? आता आजचा भाग संपवण्याआधी आजच्या शब्दांवर एक नजर टाकू, हे शब्द सामाजिक बाबींबद्दल बोलणारे होते. ‘To have a positive impact’ म्हणजे सकारात्मक प्रभाव पडणे, ‘to bring about social change’म्हणजे समाजात घडणारे बदल नजरेस आणणे, ‘a basic right’ म्हणजे मूलभूत हक्क, ‘a luxury people cannot afford’ म्हणजे, चैनीची न परवडणारी गोष्ट. आज इतकंच, पुन्हा भेटू English together च्या पुढच्या भागात. Bye! Laura was an excellent teacher. She ______ on her students’ lives. अशी गोष्ट जी प्रत्येकालाच मिळायला हवी. Primary education is ______. Everyone should have it, not just those with money. Leo didn’t like his boss, but he needed his job and didn’t want any problems at work. Complaining was ______. The new government did many things differently to the previous government. They ______.